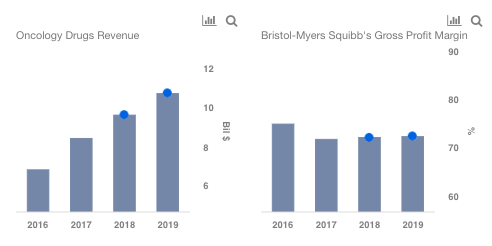 Bristol-Myers Squibb (NYSE:BMY) generates its revenues from its Oncology, Cardiovascular, Immunology, Virology, along with its Mature Drugs & Other segment. Oncology accounts for over 40% of the company’s total revenues, and will likely see steady growth in the coming years, led by a ramp up in sales of its blockbuster drug Opdivo. The Cardiovascular segment will likely see strong growth in the near term, given the trends in Eliquis sales. We have created an interactive dashboard ~ What Are Bristol-Myers Squibb’s Key Sources of Revenue. You can adjust the revenue and margin drivers to see the impact on the company’s overall revenues, earnings, and price estimate. The Oncology segment has seen explosive revenue growth over the last few years, and stood at a little under $8.5 billion in 2017. This can primarily be attributed to its blockbuster drug Opdivo, which garnered close to $5 billion in sales last year, and we forecast the sales to be around $6 billion in 2018, and $8 billion in the coming years. Opdivo is the leader in the immuno-oncology space, and will likely continue to see strong growth. The drug has been approved for a number of indications, and now it is also approved with a combination of Yervoy for three types of tumors. This should bode well for the future sales of the drug. Note that the company also has a new compound Prostvac in its late stage pipeline, and it has a potential to generate over $1 billion in peak sales. Bristol-Myers Squibb’s Cardiovascular segment accounts for roughly a quarter of the company’s total revenues. The segment revenues have grown from $1.9 billion in 2015 to $4.9 billion in 2017, led by its blockbuster drug Eliquis. Of late, Eliquis has seen market share gains amid increased acceptance. The drug is expected to be safer than warfarin, and the partnership with Pfizer has given it a strong global reach. We forecast the segment revenues to grow in mid-20 percents in 2018 and in low-mid single digits in the later years. Note that Eliquis sales were up around 40% in the first half of 2018. The drug will lose its patent exclusivity in 2022, and it will likely see a decline in sales from 2022-2023, as it will face increased competition. The Virology segment, which primarily includes Reyataz, Sustiva, and Baraclude, has seen revenues decline in the recent past, as Reyataz and Sustiva lost their patent exclusivity in 2017. We forecast a significant decline in revenues in the coming years, as there is no new compound in the company’s late stage pipeline. Among other segments, Immunology accounts for over 10% of the company’s total revenues. The segment will likely see mid-to-high single digit growth in the near term led by Orencia. However, Orencia’s patent exclusivity in the U.S. expires in 2019, while the EU patent exclusivity ended in 2017. Orencia’s sales will likely see some decline following its patent expiry. Mature Products & Other segment also accounts for roughly 10% of the company’s total sales. Most of the drugs in this segment have lost patent exclusivity, and face biosimilar competition. As such, we forecast the sales to decline in double digits in the coming years.